Mayans had the Temazcal – which roughly translates as sweat lodge – while the Japanese have the mushi-buro, Russians have the Banya, and Finns have the sauna. Heat has long been used therapeutically in many cultures, and for good reason. Since posting about the science-backed benefits of sauna bathing and a review of the sauna I chose, I’ve received a few questions about how to sauna, and whether or not it’s safe for breastfeeding moms and/or kids. 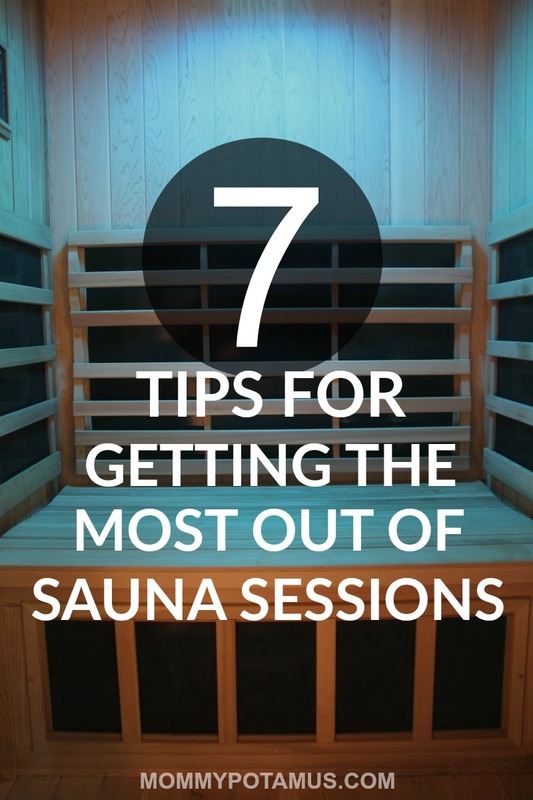 Below is a guide to the basics of sauna bathing, plus a FAQ section – I hope you find it helpful! Quick note: As always, that this is not medical advice and you should always talk to your healthcare provider about any questions you have. Now that we have that out of the way, let’s talk about what the research says regarding safety. As I mentioned earlier, sweating helps to eliminate heavy metals, PCB’s, BPA and other toxins. However, it also depletes our bodies of water and minerals, so we need to replenish both. I drink a glass of water before heading into the sauna, and also take a quart-sized mason jar of electrolyte-rich water (and a jar of plain water) in with me to sip on during and after I sauna. Most sources recommend starting with a 10-15 minute session, increasing the time spent as you feel comfortable. I usually spend about 30-40 minutes in my sauna, depending on whether or not my kids game of Memory or Wildcraft is going well. 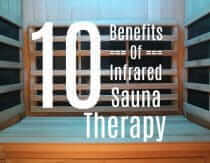 Some infrared sauna studios book sessions up to an hour – that seems to be the generally agreed upon max time. Breathable, washable natural fibers are ideal for use in the sauna. I prefer a cotton towel, while my kids prefer oversized t-shirts. I also place towels on the bench and the floor to keep the surface of the sauna clean. Once I finish a session, I toss everything in the laundry hamper so that all the stuff I sweated out can be washed away. Saunas increase the flow of nutrients (glucose, amino acids, fatty acids, and oxygen) via the circulatory system. While it may seem like the perfect time to be pulling in more via digestion, the reality is that digestion gets put on the back burner while the circulatory system ramps up nutrient delivery to the muscle and skin. For that reason, it’s best not to eat a heavy meal right before stepping into a sauna. If I’m hungry I opt for a light snack, then eat when my session is over. If you feel lightheaded, queasy or off in any way, end your session. It’s not weakness, it’s wisdom. If you’re using the chromotherapy feature, stick with red light at night. Blue light (and possibly other wavelengths on the spectrum) can disrupt your circadian rhythm and make it difficult to fall asleep. Is sauna bathing okay for pregnant and breastfeeding women? On the flipside, some practitioners recommend avoid saunas entirely during breastfeeding over concerns about toxins being eliminated via breastmilk. Similar concerns are expressed regarding pregnancy. 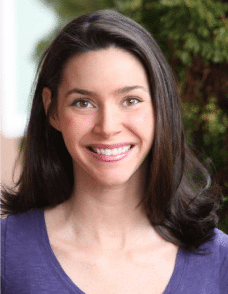 Recently I asked a practitioner who recommends avoiding saunas during pregnancy/breastfeeding if he would make the same recommendation for a mama who had been living a holistic lifestyle for awhile (eating clean, avoiding toxic household cleaners, etc.) as a mama who was just starting her wellness journey. 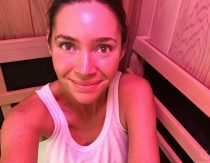 His reply was that he’d be comfortable with the mama living a holistic lifestyle using a sauna, but felt it would be too intense for a mama who was just starting out and therefore had a higher toxic burden. Please talk to your healthcare practitioner when deciding what is right for you. Is sauna bathing safe for kids? Regarding use with children, it’s important to use common sense and evaluate an individual child’s readiness. I wouldn’t bring a very young child into a sauna because they aren’t able to communicate when they need to get out – and really they’re still mastering the task of maintaining homeostasis – however my three-year-old joins me for a snuggle when he feels like it. I’m comfortable with that because he can communicate with me and hop out whenever he wants to. Who should avoid sauna use? Here’s the sauna I use now. 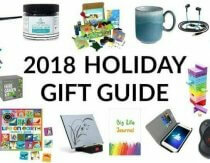 Find out why I chose it in this post along with how to get hundreds of dollars off your order, plus a free ergonomic backrest and aromatherapy cup. They do offer an option that allow you to spread payments over 12 months. There’s no interest, and you can pay it off early if you want with no penalty. We got the Sanctuary 2. It’s perfect for two people and comes with a sound system and ergonomic bench that is super comfy. I was curious about near vs far infrared sauna. I cannot do the far because of the intense heat, but I can do the near – which some people say is safer to do. I was curious what you thought about near vs far sauna. 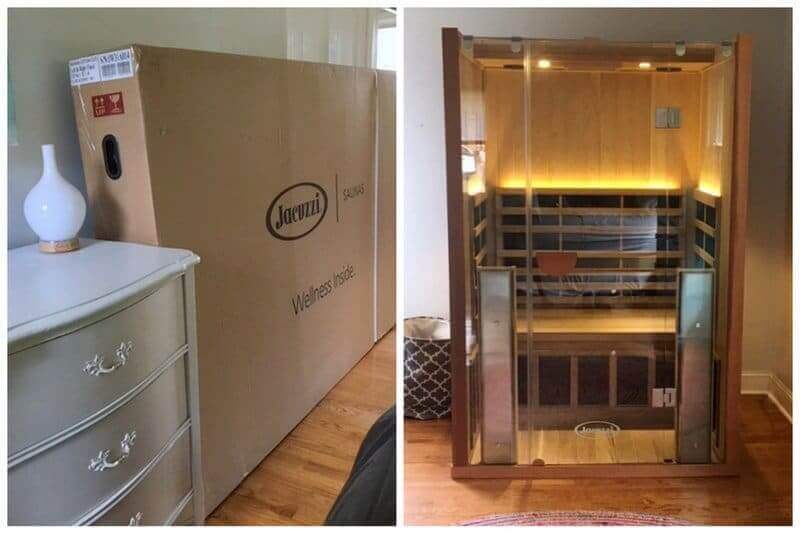 I bought the mPulse sauna on Black Friday with the Chromotherapy and ART upgrades, thanks to your recommendation. I absolutely LOVE my sauna! However, I am very confused still about the colors and when to use them. You say to use the red at night and avoid blue to prevent disrupting your sleep cycle. From what I’ve read, red increases circulation and energizes, and blue calms and relaxes. When I use the “Relaxing program” and red lighting before bed, I’m wired and cannot sleep for several hours afterwards. Am I doing something wrong? Please help me understand. I also had a question about my hair. Should I be doing something to protect it from drying out while in my sauna? Hi April, the mPulse is actually made by a different company than the one I purchased from so I can’t speak to specific settings, but I can touch on the light issue in general. Our circadian rhythms – which control when we feel alert and when we feel sleepy – are tied to light and darkness. Biologically, we’re hardwired to see blue light in the morning (think sunny, clear morning light) and reddish light in the evening (like firelight). When we see what our bodies interpret as daylight (blue light) in the evening it confuses our circadian rhythm and disrupts sleep. 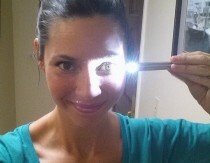 In esthetician settings, blue light is more often used to “calm” inflamed, acne-prone skin, while red light is used to encourage collagen production by inducing hormetic stress – a good kind of stress that encourages the body to generate new collagen, etc. I find that red light at night helps me achieve a calm focus followed by restful sleep, but some people fine that sauna therapy is very energizing. I’m not sure why this is, but if that’s the case for you it might be best to do sauna sessions earlier in the day when possible. Just purchased my sauna and can hardly wait for delivery. How often should one sauna? We love our sauna. My husband made it after being inspired on our family trip to Sweden…. when we got back he ordered a bunch of logs and set to work with my sons! One thing we love to do ( and find very useful) is to wear a sauna hat… it stops the heady feeling but brings out a better sweat! I also love to munch on sauerkraut after a session! Any advice on timing workout with sauna? I am thinking to only have one shower, I would do them both and then shower. Busy gal, I want to be healthy but time is a factor. Intersted in a infared sauna for our home. We are doing a home reno and will be back in may.. can u send me pricing? And and sizes & anything else plz! What is a good temperature to set the sauna at? Hi Heather! I see the Mpulse sauna mentioned in some previous comments here. I’m getting emails from reps from both Clearlight and Sunlighten, and I have to make a decision quickly to take advantage of the cyber week sales. 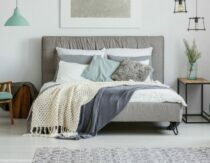 At first I was leaning towards the Clearlight Sanctuary that you chose, but Sunlighten sent me some compelling claims, as well…if you happen to have time to help me compare them I’d be so very grateful! 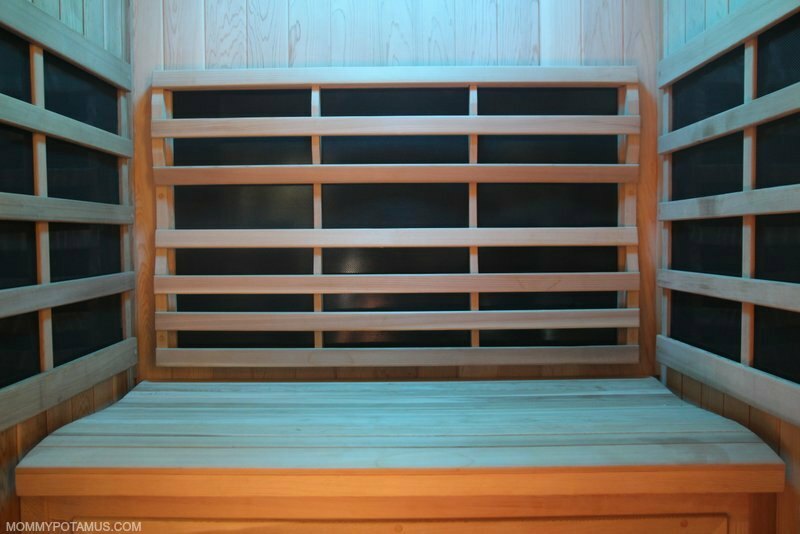 Your post should say that you are talking about an infrared sauna right at the beginning. I have a Finnish hot stone sauna and the use of that one is different. The temperatures are so different! Mine reaches up to 80°C. You should not stay longer than 15-20 min in there. After the sweat you shower cold. Some use even ice baths. It pushes your immune system. You once used a portable, tent looking sauna, I believe? Which one did you use and why did you stop using it? We’re looking into purchasing a sauna but financially, we can likely only afford the portable type, for now. Thank you in advance! 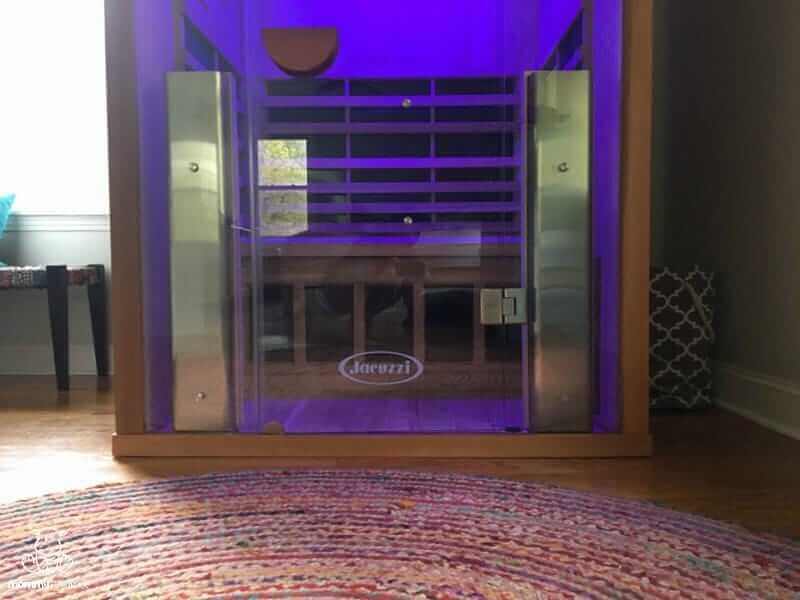 It was a little awkward to sit in and doesn’t have all the same benefits as the sauna I use now, but it was definitely a good starting place that allowed me to experience sauna therapy and realize it was something I wanted to do way more of.